Rebecca Mason is a UK based artist using light to convey the darkness within human life, existence and emotion. Exhibiting widely in London since early 2013, her detailed and distinctive quasi poetic creations have been described as "an extraordinary mix of truth and beauty through which she is able to engage her audience with brutal observations about life, love, money and culture using her honest, and often humorous, interpretation of the modern world". Rebecca divides her time between the UK's capital city and Folkestone on the Kent coast, where she moved from East London in mid 2016. Rebecca had firmly established herself on the London neon art scene by mid 2015 having created over 40 neon pieces in the 2.5 years prior. At the time of writing (mid 2018), Rebecca has created over 70 different pieces. 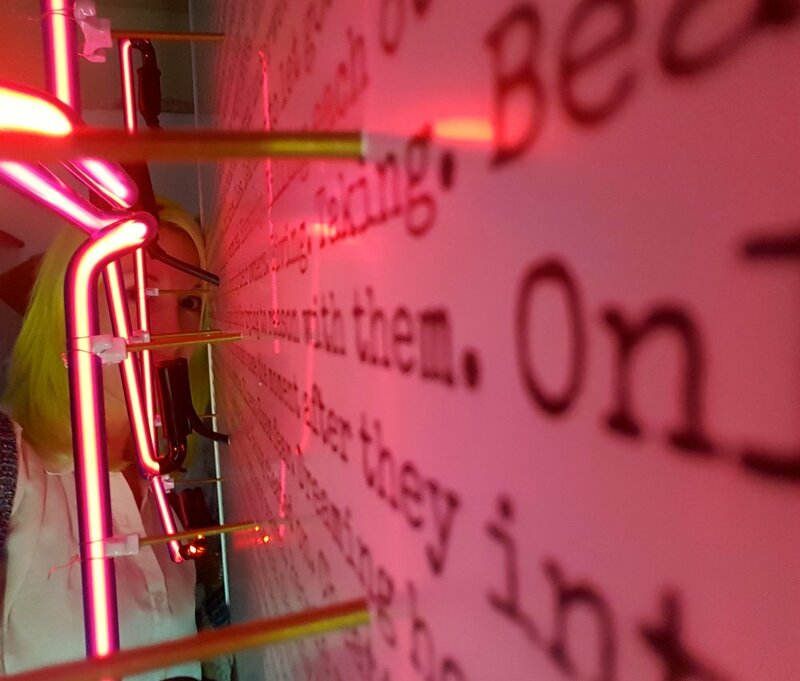 Rebecca’s work is a distinctive style incorporating typed text backgrounds upon which sit a neon or argon filled glass word or phrase in her own handwriting, always separate letters (never cursive joined up text). These backgrounds cover different takes and elements on the the overall theme (as captured by the light itself) and are occasionally accompanied by relevant imagery. The background text is written by Rebecca herself (bar a couple of pieces incorporating short lyrics or quotes, copyright always covered where needed) meaning she spends a long time coming up with content, analysis and angles on a theme. Some works have been in progress for 3-4 years as she dips in and out of the subject matter and refines ideas to reach her final text, order, placement and message. Using the brushes of neon and text to create a gritty and simultaneously delicate world, Rebecca draws inspiration from the exciting, chaotic playground of London. Musing on her life experiences, mistakes, feelings, events of the wider world and politics, her work focuses on day to day realities of human existence. In essence, Rebecca's work encompasses themes of inequality, fear, envy, misinformation, disinformation, hypocrisy, imperfection, prejudice, blame, judgment, assumptions, truth, acceptance, power, control, chaos and wilful oblivion. Rather than a purely negative commentary on society, Rebecca sees her work as a representation of "truth" about our human behaviour (although would debate whether there really is "a truth" too). Such content includes the realities we may need to accept and face in order to attempt to address/fix our individual and collective problems rather than burying our heads in the sand. Rebecca argues that if the work makes people feel uncomfortable or sad, could it be that they have not faced up to the reality of human life, do they prefer to live in a bubble? Does that help remedy issues or is it necessary for self preservation in the face of power imbalances? Rebecca does not pretend to have the answers, and recognises her own hypocrisy too. She often deploys self deprecating humour and wit to convey her message/discussion points, along with meta elements carefully included within a piece (e.g. flaws in her "flaws" neon, deliberate errors in "error", a background that is slightly mirrored but not clear in "fake" aka "going up in smoke and mirrors" etc). She is also a fan of regularly mocking herself and the art industry and enjoys taking a commercial art form and making it darker and less commercial than a lot of neon art exhibited today. Rebecca did not come from an art school background. She grew up in a working class family in the Midlands and was fortunate to get into a good uni. She obtained a BA and MA in Economics from the University of Cambridge, before going on to work for 15 years in various regulatory roles in the City, focusing on the rules and moral obligations and practices of large global financial institutions. Many of the themes she saw and experiences she had during these times are present in the works she has produced. At the start of 2017, Rebecca also established Sentient, a new physical and online gallery and design space, which she manages and curates by herself and occasionally also cleans and tidies (if you've been there, you'll know she doesn't clean or tidy very often). Apparently she is too busy to clean and tidy due to writing long winded "about" pages on her websites.